You can also read Disability News Service’s report of the event here. There is more information about the summit here and the event is on YouTube, with BSL interpretation here. “Hello my name is Simone Aspis – I am Policy and Campaigns Coordinator for the Alliance for Inclusive Education, a member of Reclaiming our Futures Alliance, an umbrella organisation consisting of Disabled people-led organisations. “Today, the UK government is asking other countries to sign up to a charter which talks about the importance of holding governments to account under the CRPD and yet our government stand in breach of it – hypocrisy! “In 2016, Inclusion London and DPAC submitted a complaint to the UN Monitoring Committee on how government’s austerity plans were fundamentally breaching Disabled people’s human rights to independent living, and a decent standard of living and work. The Independent Living Fund, a fund that allowed Disabled people to live independently in their own homes, was going to be withdrawn. This meant for many Disabled people, they would be prisoners in their own homes or forced into institutionalised care, a campaign we fought against over 30 years ago. This was the first time that the CRPD monitoring committee have been asked to investigate complaints under the optional protocol against a state. Disabled people’s complaint was upheld. The UN disability committee published the findings of an extensive investigation which found evidence of grave and systematic violations of Disabled people’s rights due to welfare reforms. As we expected our arrogant government dismissed these findings. “In 2017 the routine examination of the UK government’s implementation of the CRPD took place. The UN disability committee made over 80 recommendations and commented that in the history of the committee, members have never been as concerned about a country as they are about the UK today. The Chair described the “human catastrophe” caused by the government’s “social cuts” as there is continued evidence of deliberate, systematic and dramatic retrogression of Disabled people’s human rights. “The UK government has said for the second time that they do not agree with the findings. The UK government attempted to defend their record, by saying that the state of Disabled people’s human rights is worse in other countries. This is government’s failure in understanding that the CRPD is about the progressive realisation of Disabled people’s human rights. 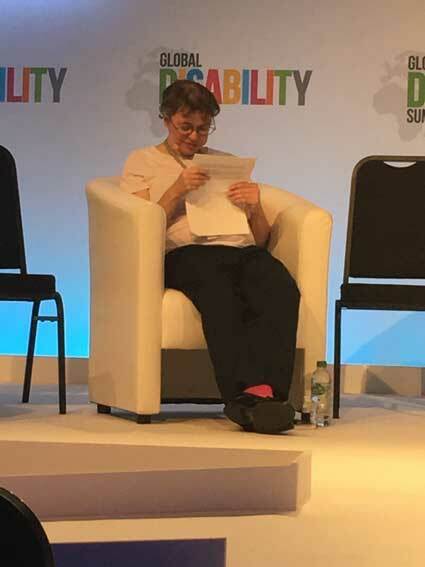 “UK DPOs [Disabled people’s organisations] absolutely welcome the giving of support and aid to our Disabled brothers and sisters in other countries but we must also not let the UK government get away with its deliberate dismissal of its obligations under the CRPD because if one government can get away with it then others will follow. “We must all make sure that the charter being introduced at the summit does not become a substitute for proper implementation of the CRPD and a way to water down our rights and our ability to hold our governments to account. “In the UK, DPOs are campaigning for the enshrinement of the CRPD in domestic legislation. “We call on our government to implement the inquiry recommendations from the UN disability committee, all of which they have dismissed, including carrying out a full cumulative impact assessment of welfare and tax reforms. “We are also calling upon our government to reverse welfare reform measures that have been seriously adversely impacting on Disabled people’s standard of living since 2010. “We are also calling for a national independent living support service independent of local authorities and funded via general taxation to halt and reverse the re-institutionalisation of Disabled people that is happening here and to meet our rights to Article 19.
well done Simone. Thank you!